i b i k e l o n d o n: Thank you, flashmob cyclists! In about 24 hours notice, and through the powers of Twitter and Facebook and blogging, about 300 people on bikes from all different backgrounds got together to ride across Blackfriars Bridge and demand that TfL and the Mayor start creating truly safe and comfortable conditions for cyclists; the majority road user on this bridge at peak times. Cyclists gather on Blackfriars - thanks @CityCycleCop for looking after us! There were office workers in crisp new shirts on stately uprights getting ready for their day on a City trading floor, cycle couriers in lycra ready for a day running around town. There were children in Bakfiets and Mums and Dads on bikes. Old riders, young riders, thin riders, fat riders. And commuters. Many, many commuters. All are people who just want to be able to get from A to B in the safest possible way and who are sick of being made to feel like a second class citizen simply because of the means of transport they choose to use. Yes, TfL have agreed not to rip the cycle lanes out of Blackfriars Bridge northern junction, but they're still proposing we wobble along in tiny lanes alongside acres of fast moving traffic. They're still proposing to up the speed limit to 30mph, without any kind of statistical justification and despite the fact that the current 20mph model works well. This is not a vision for a cyclised city, for a civilised city, and if the so-called 'cycle revolution' has been somewhat over-spun till now, now it is clearly time for our city fathers to start putting their money where their mouth is. The only thing that is truly holding back mass cycling in London is the political will to create the conditions that will make it happen. 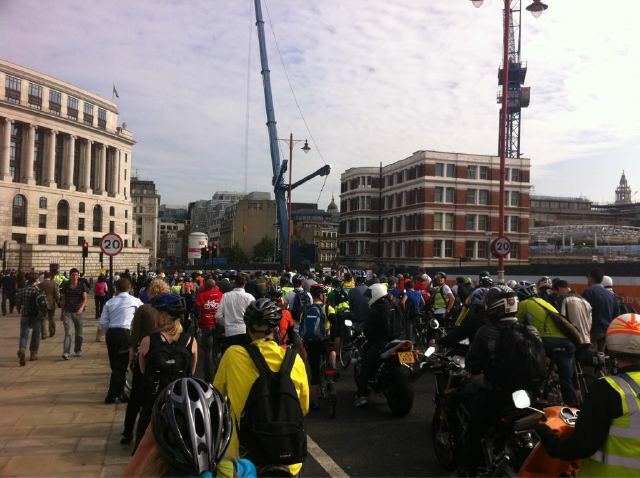 A magnificent sight; hundreds of cyclists (and two motorbikes(!)) let their feelings be known; 20 is plenty, and make space for cyclists! And of course, the whole issue isn't really about cycling at all. It's about better conditions for people on foot, better conditions for people on bikes, and better conditions for drivers, too. How many people stuck in cars every morning would like to ride and walk, if only conditions were better, and safer? It's not about cycling, per se, it's about creating a cityscape that is accessible and equitable for all. We have to move away from the 1960s 'motorways of tomorrow' road building model, and if we have to drag TfL traffic designers along with us, then so be it. 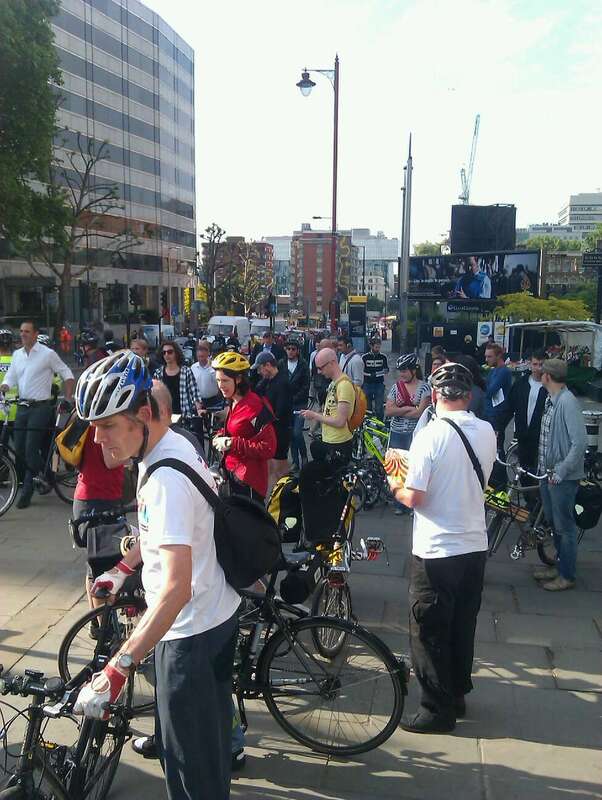 Thanks, cyclists of London, for making this happen at such short notice and for coming out and showing you care - I was proud to be a London cyclist this morning. Stay tuned for next steps! P.S Apologies to a lot of my Twitter followers who came along and who I didn't have the chance to meet - maybe next time! It's great that so many people turned up at such short notice. I would have loved to be there but had to be at work early today on the other side of town. I totally agree that the revised TfL plans are barely an improvement. Obviously it's nice that they didn't scrap the cyle lane, but it's barely scratching the surface of the problem, which is that London's roads and bridges are fundamentally hostile, unpleasant and dangerous to ride or walk on. Thanks Linday, you've hit the nail on the head right there. Thanks for your support! I missed the event but great to hear about it. I agree we need to emphasize this is not just about cyclists. Especially the 20mph limit is good for everyone: pedestrians and residents because of less noise and pollution, and drivers, too: in built-up areas lower peak speeds can improve traffic flow and average speed, by reducing accidents and improving lange change/ merging manoeuvers. Fantastic protest! We need more of these, and soon. There seems to be a little bit of political will out there, now is the time to capitalise on it. Here in Edinburgh there are a lot of horrible roads (often 6 lanes wide). Decades of quiet campaigning appears to be making very slow progress (but is necessary!) but I think it's time for some mass protests too. Expect more protests like this one across the country! If we are to have other events of this type, in addition to rides at specific problem locations, could we have a cycling equivalent of London's "Slutwalk" - the idea being that as the Slutwalk is intended to draw attention to victim blaming attitudes towards women, we could do the same thing regarding victim blaming attitudes towards cyclists and other vulnerable road users? There is the World Naked Bike Ride but this would be more prudish and more political. Now would be a good time when one considers that "road safety" is going to be a big topic once again. Saw London News on Friday night, you came across really well. Great to see direct action that doesn't end up in a riot! Well done. All well and good having a single protest ride about this but really when is the next one? Surely the pressure needs to be kept up now?